Just 10 years ago there was barely a backpacker in Colombia- the violent guerilla conflict and frightening drug cartels made the country far too dangerous for travellers to consider. These days it’s one of South America’s most popular destinations, but much of Colombia is still trying to adapt to the huge tourist influx. Litter and bad roads are trademarks of lots of tourist destinations, but luckily Colombia boasts plenty of pristine national parks that have been protected from the negative impacts of tourism. 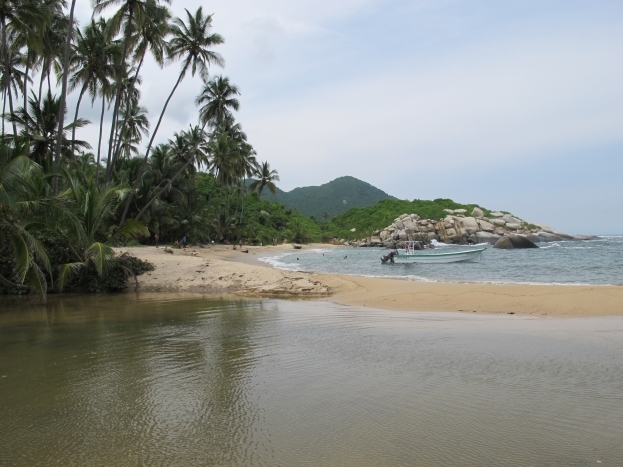 Parque Tayrona on the Caribbean Coast is one such park, boasting unspoilt beaches and pristine jungle to satisfy nature-loving holidaymakers. The park is a car-free zone – supplies are delivered to the campgrounds and restaurant by donkey or horseback and tourists have to make their way in on foot. That’s enough to deter a lot of people, which means you’ll often have the beaches to yourself. Credible information about Tayrona is scarce, so here’s my top 10 tips for any traveller planning a trip to Tayrona. There’s no shortage of beautiful beaches for everyone to enjoy. After walking about 45 minutes from the park entrance, you’ll hit Arrecifes, a long stretch of white sand with a deadly undertow. 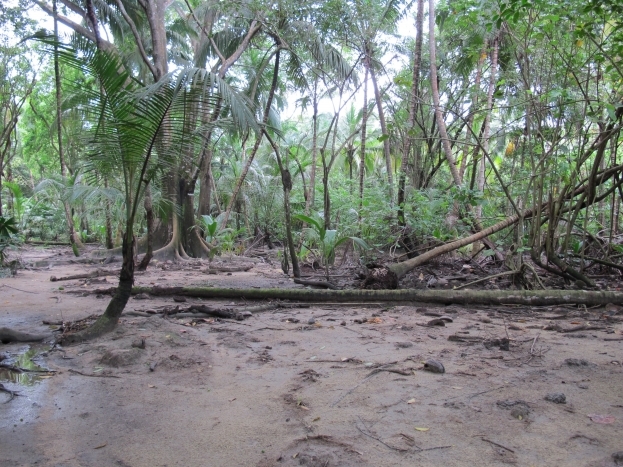 More than 100 people have drowned here, so swimming isn’t an option, however if you walk 10 minutes back from the beach through the jungle, you’ll find the Don Pedro campground, which is where we stayed because it’s cheap, popular with backpackers and is the only place in the park with cooking facilities. Keep walking along the coast and you’ll hit La Piscina, a popular snorkeling spot (bring your own snorkel if you want to see sea turtles) and further on is El Cabo, a beautiful inlet lined with coconut trees. 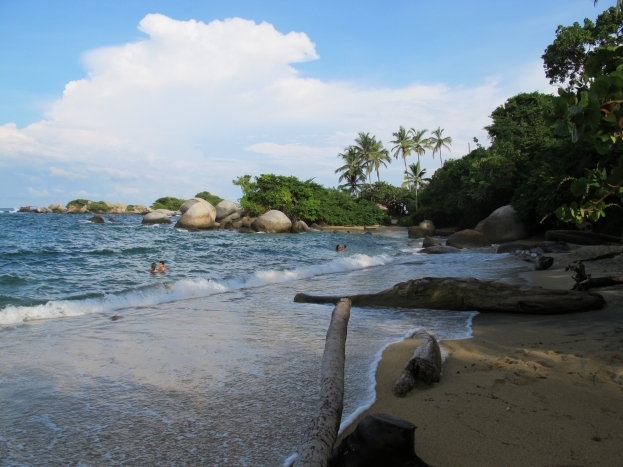 Your trip to Tayrona will inevitably begin in tourist city Santa Marta or backpacker magnet Taganga. Buses leave frequently from Santa Marta, but if you’re staying in Taganga, you have two options – a boat for approximately AU$20 per person to El Cabo beach, or a mini bus for about $7 per person. We opted for the mini bus as they pick you up from your hostel and take you past a supermarket on the way to get some supplies. It’s then a picturesque one hour drive to the park entrance. Once you arrive, you’ll be dropped off at the entrance (where you pay a AU$18 entrance fee, but it’s cheaper for students), then you have to start walking. 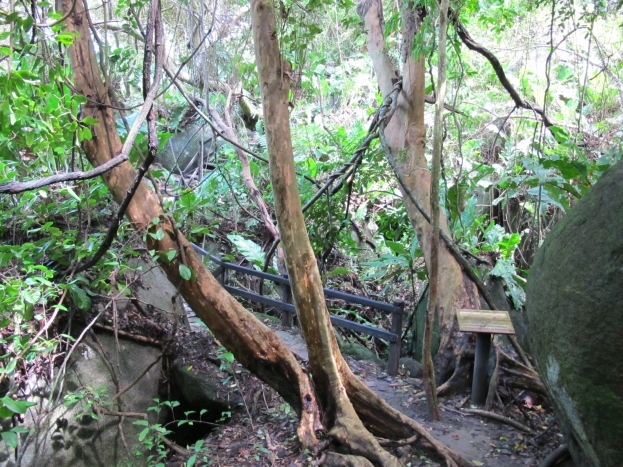 Most of the track is made of wooden and rocky paths, but occasionally you’ll come across a muddy patch. Embrace your new brown shoes. You’ve got two sleeping options – tents or hammocks. If you’ve got your own tent, you can pitch it in a campground for a small fee, otherwise you can hire one from them for around AU$25 per night. 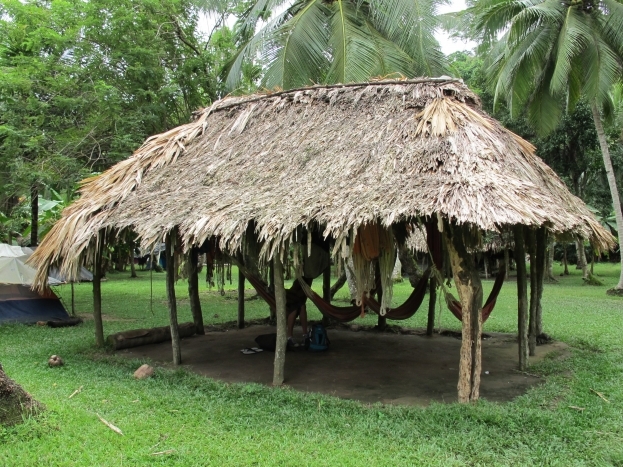 We opted to do it like the locals and sleep in hammocks for about $5 a night at the Don Pedro campground. There’s a fair chance you’ll want to stay longer than you originally anticipated, so make sure you’ve got enough moolah to fund your fun – there’s no ATMs within the park. 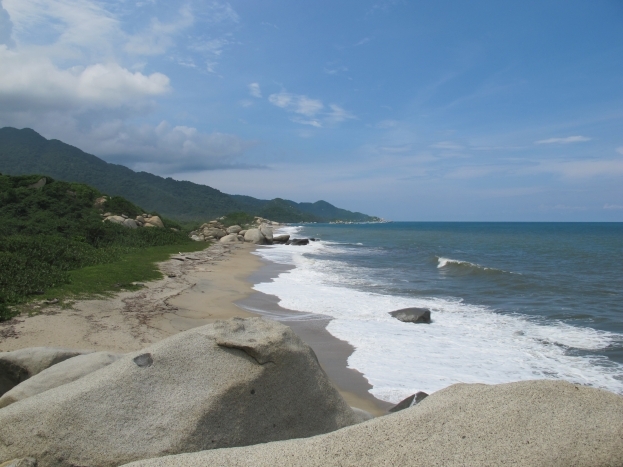 The restaurants in Tayrona are quite basic and notoriously overpriced for what you get. The Don Pedro campground offers basic cooking facilities for self-caterers. If there’s a big group of you, you can hire a donkey to carry your food the hour walk from the entrance to the campground, otherwise lug it yourself and consider it a good chance to burn off all the beer you’ve been drinking. 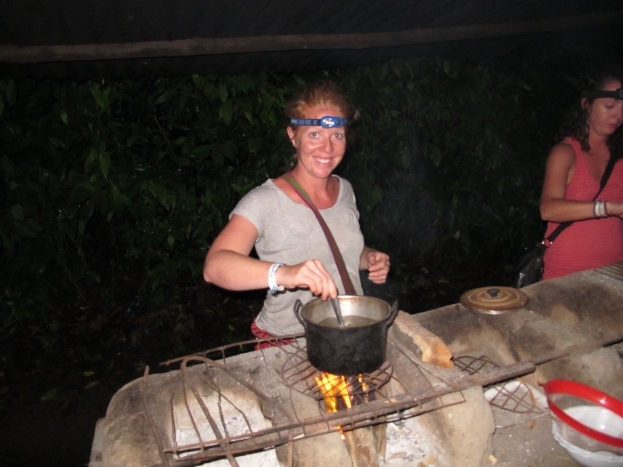 When I say Don Pedro has basic cooking facilities, I mean there’s a space where you can build a fire to cook a meal. Patience certainly isn’t my forte, so it was lucky my persistent boyfriend Joel was willing to dedicate an hour each night to getting the fire cranking for our gourmet meal of ketchup and pasta. Humidity, wet wood and a lack of kindling are not a pyromaniac’s best tools. In our three days in the national park we saw a puma run through the forest and a caimen bobbing its head in one of the rivers we had to wade through to reach the beach. It’s nothing to be concerned about, though – they’re more scared of us, right? While the weather is generally hot and humid, it does get a bit chilly at night, especially since the hammocks are often a bit moist. A pair of light long pants and a long sleeve top will keep you cosy and the mosquitoes at bay. While my hammock time wasn’t nearly as restless as I anticipated, it certainly doesn’t compare to a long snooze in a comfortable bed. Our time in Colombia was running out so we had to forgo that luxury in favour of an overnight bus to our next destination – Bogota – where we arrived extremely tired.